I thought they left. Just as I finished barking at various trespassers and started to doze on the green couch, I heard the cacophony of children yappin and squealin. “They” bounded inside, without any grace I might add. Francy and her pack of five came on Sunday. Their noise spanned an octave from the short female’s: “Awww... Dexter” to the largest male’s: “What’s up?” The grandkids, as they’re called by Good Boy, are tolerable for a day or two visit, but something was wrong this time. I knew down to my tail life would be messed up for a while. On Monday the wind howled louder than Rudy next door, and trees danced and bowed to a prince I couldn’t see. I barked my best, but couldn’t stop this monster everyone kept calling Sandy. Then something went “Crack!” like a bolt of lightning. It was the squirrel’s tree—upside down with angry roots stretched in the air. The house turned black as the deepest whole I’ve ever dug. Night after night, no movie time to curl up on Good Boy’s lap, no treats, and no room on the couch (kids hogged the soft spot.) Finally, on Thursday they drove off and I thought I could relax. But like I said, they came back. This time with their little Yorkie terror, Keyra. “Oh no!” I barked out loud when I saw her. For some unknown reason, everyone assumes we should be best friends. 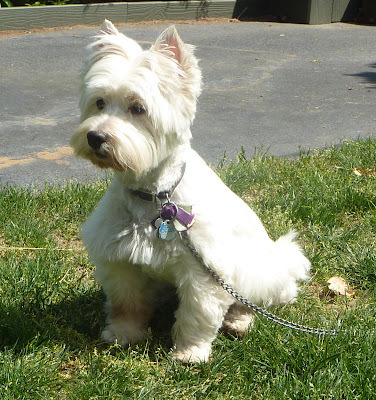 Okay, we are distantly related—I’m Westie, so also of the noble terrier family—but she, well, she has no class. I tried my best to ignore her, rest my head, and close my eyes while she circled around me jumping and yapping. Did she think I would want to play chase with her? I’m eighty-seven years old. It’s a good day if I can make it outside to do my business. I overheard Good Boy describing Francy’s house after Sandy came to visit there as well. Not good news. Sounded like Sandy filled her house with water. What a bully. Then it hit me—Francy and her pack weren’t fish, so they might be staying for like…forever? Each day Keyra stayed, she got more comfortable. She took over my guarding post on the couch; she barked at visitors; she even napped on Good Boy’s lap. And she never understood my low growls to claim my territory. I tried to be nice, but she liked to irritate me…so I can’t be blamed for snapping at her. Especially the day she wiggled under the recliner, found a plastic cup I hid, and pranced down the hall, crunching on it just to see what I’d do. I charged after her with puppy speed, barked and bit her leg til she dropped the cup. I pranced back to jump up on my favorite spot as she hid in the other room. See, this is my house, Keyra. My cup, my couch, my Good Boy. The next day, Keyra kept her distance, although she still followed me outside every time as if we were on the same schedule. And she may have ‘roofed’ an apology. Through one squinted eye, I watched her. Her brown bangs shaded her face giving her a pathetic look. As my irritation subsided, I recalled the description of their home, Keyra’s home. I imagined how she felt, losing all her hidden bones and pizza crust in a wave. She had nothing to guard or protect so she lost her job too. No wonder she tried to take over this house. Two weeks later, as Francy and the kids crammed into a stuffed car and waved goodbye, I actually felt a twinge of something; maybe I would miss them, even miss Keyra’s bark. Of course I came to my senses when I curled up on my favorite warm spot. Even a rabbit couldn’t bother me now. I thank Dexter for telling me his point of view on this true story. Even during a time of trial and losing so much, God gave us moments of laughter and is still keeping us focused on what really matters in life.